Combatants can have different animations in the field and in battle – weapons and status effects can override a combatant’s animations. Animation types are created in the ORK Framework editor in Base/Control > Animation Types. You are free to create and name the animation types however you like. To actually play an animation, it needs to be assigned to the animation type that should be played. 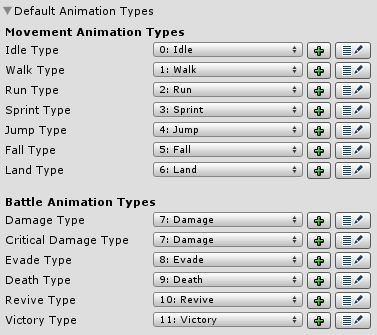 The default animation types are used to automatically animate certain events, like running, idle or taking damage. Those types are already created in a new ORK Framework project, but you are free to change them to your liking. If you don’t want to use one of the types, simply don’t assign any animations to this type, or create a None animation type without any assigned animations. Animations are created in the ORK Framework editor in Base/Control > Animations. The animations are used to bind a game object’s animations set up in Unity® to animation types. Animations can be easily shared between combatants, as long as their names (legacy) or means to activate them (Mecanim parameters) are the same. Keep in mind that you still need to set up the animations on your combatant’s prefab (game object) in Unity® correctly – ORK Framework only plays those animations. The following animation systems are supported. The legacy animation system only requires the name of the animation to play it. You have full control on how the animation will be played (e.g. CrossFade) and can optionally set the layer and speed of the animation. In mecanim animations, you need to set the name of the animation state and it’s layer. Since the mecanim system doesn’t allow simply playing an animation, you need to bind them to certain parameters. You can add the parameters to play and stop a mecanim animation. Additionally you can check the active animation state of the mecanim component and set parameters depending on their state. When using a custom animation system (e.g. when using a 2D system or you’ve created your own animation controller), you can easily integrate it into ORK as well. The custom animations allow you to define functions to play and stop animations – with whatever parameters you need to the function call (currently supported are string, bool, int, float, Vector2 and Vector3). You don’t have to define all animations in each animation setting. It’s best to create an animation setting that contains the standard animations of a combatant (for field and battle). If you need to override certain animations (like idle and run in battles), simply create a new animation setting with only those animations defined and use it as the combatant’s battle animation. The same goes for weapons and status effects – if a weapon should override a combatant’s attack animation, create a small new animation setting with only the attack animation defined.